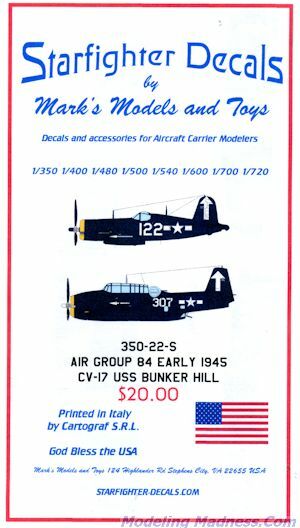 This latest carrier set from Starfighter Decals covers the USS Bunker Hill from its early 1945 cruise in 1/350 scale. This one features F4U Corsairs, F6F Hellcats, SB2C Helldivers and TBM Avengers. The Hellcats were only with VF-84 and were night fighter or photo recon birds. The Helldivers were with VB-84 and the Avengers with VT.84. The majority of aircraft were Corsairs and they were with VF-84, VMF-221 and VMF-451. All these planes were overall gloss sea blue with yellow forward cowlings. 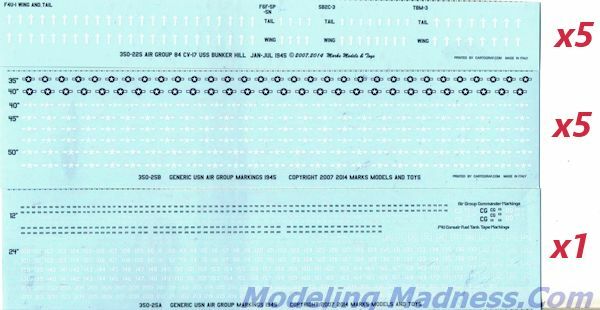 The set includes five generic insignia sheet, a sheet with aircraft numbers in both black and white, as well as five different sheets for the aircraft wing and tail arrows.. The full color instructions provide complete placement and painting information, including the measure used on the ship. Decals for this sheet are printed by Cartograf in Italy so you know they are of good quality.